An intergovernmental conference concluded 18 months of consultation and negotiation with the adoption of the Global Compact for Safe, Orderly and Regular Migration (GCM) on 11 December 2018. The GCM is a pledge from the 164 signatories to ensure that countries observe fundamental human rights for migrants in all of their policies and practices. The document was developed in consultation with Member States, United Nations organizations and civil societies. It includes 23 objectives, one of which is dedicated to the health aspect of migration. 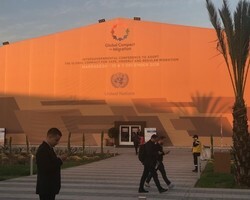 United Nations Secretary-General António Guterres opened the conference in Marrakesh, Morocco, on 10 December 2018. He took the opportunity to dispel myths about the process behind the GCM and the document itself. In particular, Mr Guterres made reference to the false belief that migration policies infringe on the sovereignty of Member States. The Secretary-General also reminded participants that the adoption of the GCM coincided with the 70th anniversary of the Universal Declaration of Human Rights, which is at the core of the migration pact. On the second day of the conference, the message from Dr Santino Severoni, Coordinator of the Public Health and Migration Programme at WHO/Europe, was the same: as enshrined in the WHO Constitution, the enjoyment of the highest attainable standard of health is one of the fundamental rights of every human being, without distinction of race, religion, political belief, economic or social condition. The International Organization for Migration (IOM) will coordinate the implementation of the GCM. It will also provide the Secretariat for the newly established United Nations migration network set up to support the GCM’s implementation at the country level. As the principal public health agency, WHO will support implementation and continue its collaboration with the IOM. WHO and the IOM have been working closely on issues related to migrant health to provide opportunities to enhance the health of refugees and migrants and their potential contribution to society. Examples of this collaboration include the first Global Consultation on Migrant Health in Madrid, Spain, in 2010 and the second Global Consultation on Migrant Health in Colombo, Sri Lanka, in 2017. The latter concluded with the ratification of the Colombo Statement, a commitment to advance the migrant health agenda. Regular consultations also led to the inclusion of the health objective in the GCM. WHO fully supports this coordinated approach, which considers health as a guiding principle for acknowledging migrants on the basis of the “one population” concept. It stands ready to provide technical support for the implementation of the GCM, and to ensure that the health aspects of migration are addressed in collaboration with relevant United Nations agencies and other national and international stakeholders. WHO is also working to strengthen efforts to better-define mechanisms for burden- and responsibility-sharing. strengthen local and national health systems to be prepared, resilient and migrant sensitive, taking into account cultural diversities and the specific health needs of migrants, in particular women and children. WHO is committed to promoting and achieving universal health coverage within the context of the 2030 Agenda for Sustainable Development. This means working towards ensuring that every individual – including every migrant – has access to basic health services. In 2019, the World Health Assembly will adopt the Global action plan to promote the health of refugees and migrants (GAP), which was called for in a 2017 World Health Assembly resolution. WHO conducted a situation analyses in each of its regions to serve as a basis for developing the draft GAP. The document was submitted to the next meeting of the WHO Executive Board, which will take place in January 2019.